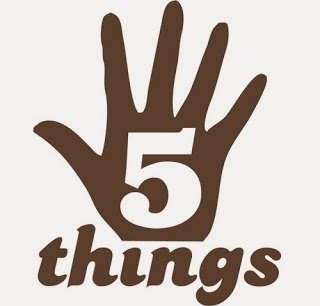 Carla at My 1/2 Dozen Daily got me started with 5 Things Friday and it was a great way to wrap up the week! We haven't done it for awhile but I just felt the need to do one this week so grab a cup of tea, put your feet up and here we go! #1...I didn't lose weight this week, in fact, gained .2 pound. My total weight loss for the month is 5.2 pounds! Not great but totally acceptable! Just think, if I do that again next month it will really add up! I am planning to start walking on my treadmill next week and maybe do some arm exercises with the weights. I will probably incorporate a few exercises to strengthen my lower back as well. I was so close to my 1 1/2 pound per week average that hubby offered to pay for my Weight Watchers Online anyway but I told him "a deal is a deal" so will just do better next month! #3...The lotion I bought for my hands, generic version of Eucerin Aquaphore, is working!!! It would work better if I used it like I should. It is greasy and doesn't absorb very fast so I procrastinate with using it. However, my thumb is healing so will keep working on it. What I really need are some cotton gloves to wear to bed at night so I can grease up and not worry about it getting on the sheets. #4...Last year I participated in the A to Z Blogging Challenge during April. For my long time readers, did you enjoy it? Should I do it again? For the month of April, Monday through Saturday, I blogged using letters of the alphabet...A to Z...ending the month with Z. It's sign-up time so thought I would put it out there and see what you think! Anyone want to join me? The fun part is visiting some of the more than 1500 blogs who are participating! The call was put out on January 27 and already 440 bloggers have signed up to participate! WOW! #5...I haven't bought any Christmas gifts yet but have been thinking about items to purchase or make. I have money saved for this purpose:) One of my goals for this year is to start working on my Christmas list in January. Having some money set aside should count, right?!!! Well, that about wraps it up for this week! I will be back Sunday night for the Sunday Night Chit-Chat! See you then!!! Good luck on the A-Z challenge!